Dragon's Lair is out on the iTunes App Store for five bucks, but if you don't have an iPhone or iPod Touch, the good folks at EA Mobile are providing an autographed, playable Blu-Ray copy that we're giving away. Here's the lowdown on the swag up for grabs: It's a Blu-Ray version of the game, which you'll remember was a series of animated sequences that you successfully advanced by joystick or button. So that means not only is this playable on a PS3, it's playable on anything with Blu-Ray capability. It also features full 1080p bonus material. You can see all the info here. The pot sweetener: the case is signed by Dragon's Lair creators: Don Bluth, Gary Goldman, John Pomeroy and Rick Dyer. Bluth was the lead animator, with artists Goldman and Pomeroy helping to create the game's signature visuals. Dyer was the president of Advanced Microcomputer Systems, and is credited with the concept that became the game, an eye-popping hit in the arcade days of 1983. Now. Here's how we're gonna give this away. We'll ask a trivia question, and you must email its correct answer to kotakucontestATgmailDOTcom within the next 24 hours. DO NOT POST THE ANSWER IN THE COMMENTS. We will choose a winner at random from all the correct guesses. 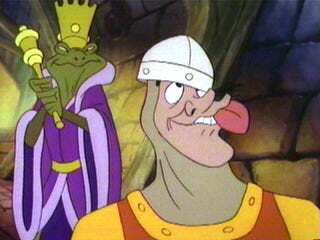 2) The subject header of your message must include the words Dragon's Lair Contest. You should probably cut and paste those words to the subject header now. 3) Your answer must be received by 4 p.m. US Mountain time tomorrow, Sunday Dec. 12. 2009. 4) Your answer must be spelled correctly to be eligible. 5) Do not post the answer in the comments. Comment submissions are not eligible. We'll pick a winner from the correct answers and, if it's you, we'll have to ask for your full name, address and phone number to have it shipped. Princess Daphne was in fact voiced by two women in the original Dragon's Lair. Lucille Bliss, the voice of Smurfette, was one. Who was the other? Remember, correct answer, correct spelling, correct subject header. Thanks!